ESD flooring has a variety of uses and in the latest blog post from Relay Floor Systems, we discuss the importance of ESD flooring for many working environments. ESD flooring may be used in both commercial and industrial environments, where components, equipment or individuals need to be protected from electrostatic damage. If installed and maintained properly, the tile can be used as your primary ground, with the conductive properties of the flooring lasting for the lifetime of the tile. Simply put, electrostatic discharge is the release of static electricity upon the contact of two materials. Whilst electrostatic discharge can be harmless, in certain industrial environments, it can cause a variety of issues, which can cost the business a lot of money. Many electronic devices are susceptible to ESD events that occur at a low voltage. For instance, components in a hard drive can be sensitive to 10 volts. Due to the sensitivity of many electronic devices to ESD, they are often manufactured with protective measures in mind. 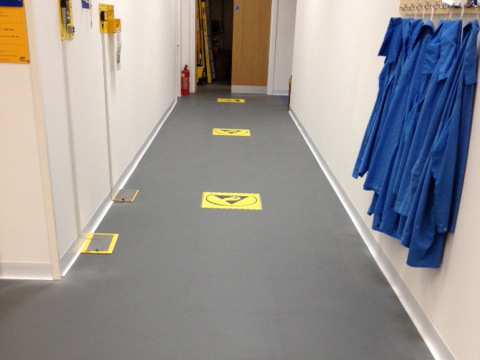 For example, staff members may wear ESD control footwear and work on an appropriate ESD floor or mat. ESD floors have a conducive matrix installed, making it electrically active, meaning electrical currents can travel through it. Unwanted static discharge can have consequences that range from a small shock felt by an individual, to much more serious events, such as where an unwanted spark leads to a large explosion in flammable environments. Here at Relay Floor Systems, we have been supplying ESD floor tiles to a wide range of businesses for many years. If you would like to find out more regarding the specifications of our flooring, or find out about any of our other products, we welcome you to contact us. Please call today on 01543 258889 or use our online contact form.